One of Simulmondo's most obscure games, The Basket Manager is a game in one of the niche sub-genres in sport: basketball simulation. 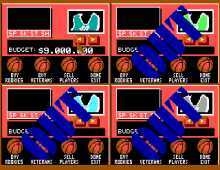 It can be regarded as the coaching simulation companion to their earlier Basket Playoff, an arcade-style basketball game. As a team manager, you are in charge of buying and selling players, crafting strategies for each match, and oversee your team's finances. The game is quite limited due to lack of real-world licenses, but on the upside you can compete with up to 4 other managers, any of whom can be computer or human. Player statistics are provided, although they don't seem to make that much of a difference on the court. Overall, worth a look for fans of the sport, but don't mistake it for a realistic simulation. It's a curious title that hangs in a limbo between arcade gameplay (which Simulmondo is good at), and an accurate portrayal of basketball coaching. Negligible to say the least.